Rip through tough, hard-packed, and frozen material with the powerful force of the ripper attachment. Built for maximum penetration, the ripper attachment tears through tough soil and frozen ground with rugged force. Gussets provide heavy-duty ripping power, and a heavy-duty shank reinforces the attachment structure for maximum uptime protection. The single-point tooth design delivers optimum penetration, ripping through frozen ground and through root systems with ease. And once the ground is loosened, simply replace the ripper attachment with a bucket to finish cleaning the hole. 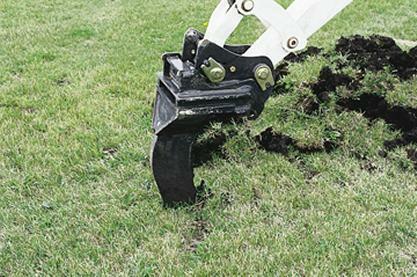 Penetrate, scarify, and remove with the powerful tearing force of the ripper attachment. Gussets: Built for rugged applications, heavy-duty gussets provide maximum ripping power through tough materials. Replaceable Single-Point Tooth: Designed for optimum penetration, the single-point tooth rips and tears deep into frozen ground and soil, delivering optimum ripping results. Ripper Shank: Reinforces attachment structure, delivering heavy-duty uptime protection.